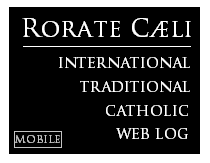 RORATE CÆLI: Radicati EDITORIAL: Our dedication to Tradition must be total, we cannot settle for anything less. Radicati EDITORIAL: Our dedication to Tradition must be total, we cannot settle for anything less. Will anything change in the Church? Will we see the end of the modernist crisis? Will we see the Church return to Tradition? Humanely speaking, we have to say no. This crisis has been going on far too long for a probable rebirth on the human level. Catholics with a taste for the things of the world are so widespread now and Tradition so scant that it is discouraging from a human point of view. So, we may well say that we’ll not see a return to Tradition according to human predictions. Yet, we pray and work every day for Tradition to return as the universal patrimony of the Church. We ‘do’ Tradition for this reason, we ‘do’ it so that everyone will return to it and that the Church will be rid of the modernist poison in Her doctrine and pastoral work. Would there be any logic in embracing Tradition and passing over to the Old Mass just out of personal taste? What sense is there in “doing” Tradition if there is no desire for its return and total reign in the universal Church? This would be a senseless game to play! And we won’t play it! Yet, is this desire – with no basis, humanely speaking - not kind of utopian? No, it is not an impossible utopia seeing that the power of God is involved. It is God who guides history – it is His omnipotence; “nothing is impossible to God”. Dear brothers and sisters, we need to avoid the temptation of practical Naturalism which we find even in those who call themselves Traditional Catholics. Practical Naturalism, when considering the historical events of the world and the Church, does the same, it calculates on the basis of human efforts alone. It may pay lip service to the idea that God can do anything, but this power doesn’t enter into the logic of choices and actions. When this practical Naturalism is in the actions of Catholics it’s devastating: it makes them act according to human prospects, not God’s. There are many who love Tradition and realize it corresponds to the truth and the faith, but then they act according to human calculations! 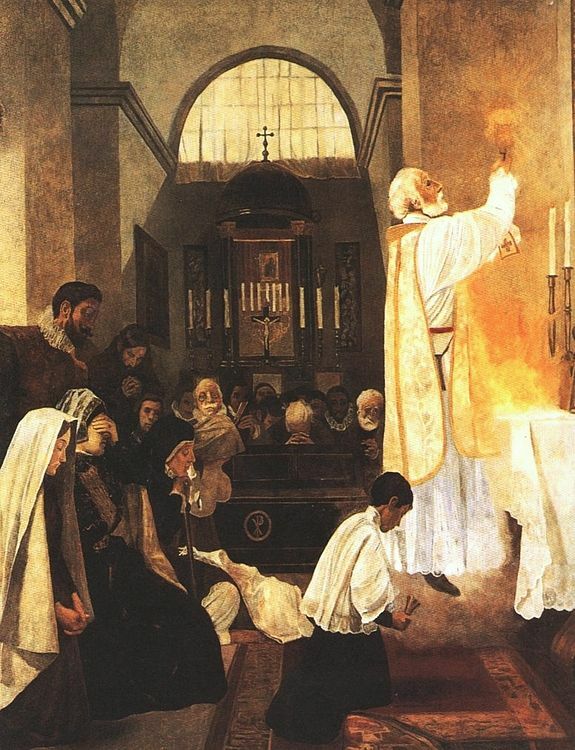 They say: “The Tradition of the Church is so true and beautiful – then they add – the Church can never return to Her glorious past; let’s therefore be prudent and settle for something less”. For Catholics like these, possibilities are not based on God’s truth, but on human calculations. There is no place in their calculations for grace: they are naturalists. There is no place for God and no place for a miracle, which is actually the norm in History. True Catholics in the span of two thousand years thought and acted differently. They acknowledged God’s Truth, wanted it in their lives and worked and struggled for the world to acknowledge and accept it. This is how Christianity was spread throughout the entire world. They based their actions on the reality of grace and on the omnipotence of God, not on human calculations and limitations. That’s what the martyrs did. They are the saints par excellence who died asserting God’s truth, trusting that one day God would have brought the work to completion. They died without seeing the triumph of the faith; they died conscious of a solitude where God alone dwells, leaving their future [entirely] in His hands. They experienced the only thing that merits serious worry, that of sanctifying the present in absolute faithfulness to Our Lord Jesus Christ. Likewise, what is there to say about all of those Catholics, such as those in Japan, who for centuries resisted, faithful to the Lord, with a Pater and an Ave, without Sacraments, transmitting the faith to their children and leaving the future in God’s hands, certain that one day a missionary would have returned with the Sacraments? They were faithful to God in the present, leaving the outcome of their testimony to Him. 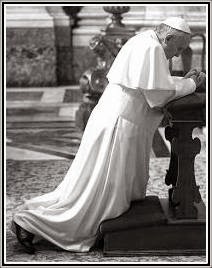 Dear friends, we also have to do the same, being faithful to God in the present, preserving Tradition which is the very nature of Catholicism, we leave the future in His hands. This is the only reasonable position. It is in this radically anti-naturalist position, certain in the power of Grace, that our sacrifice, united to Christ’s, has any sense and value. The alternative is a mess: wanting a little bit of Tradition here and there, countless compromises at church and home, complying with the sin or error that surround us, evading sacrifices, settling for less as we can’t expect to have everything. Many do this: they hold onto a little bit of Tradition but yield a lot to current trends, leaving the responsibility of testifying to God. We need to do the exact opposite: our testimony has to be total, leaving its fruits to the grace of God. We mustn’t be naturalist Catholics. The naturalist Catholic is foolish and myopic – he says he believes in God then subtracts His Lordship from reality and time. We need to be mystics, in other words, Catholics. Mystics see God at work and start with that. We need to remain mystics, while all around us mysticism is breathing its last in politics - including ecclesiastical politics.